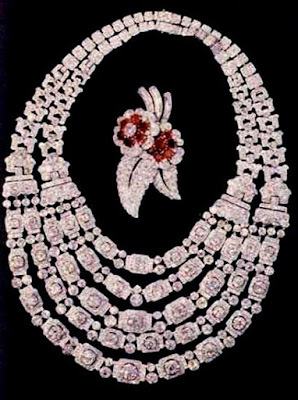 The Greville Festoon Necklace is one of the most impressive pieces from the Greville bequest, the collection of jewelry left to Queen Elizabeth (the future Queen Mother) in 1942 by the Hon. Mrs. Ronald Greville. The Cartier design has five rows of diamonds set in platinum, each row containing plaques of diamonds centered by large brilliants and separated by groups of two brilliants. The necklace is really two pieces that can be worn separately or as one. The longer necklace has two strands and was made first; the shorter necklace has three strands and came later. 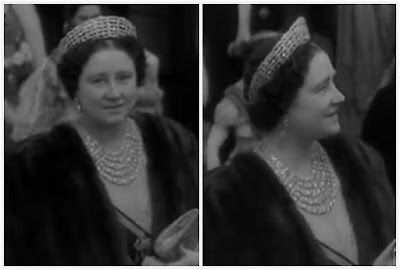 Hugh Roberts notes in The Queen's Diamonds that the first version of the necklace with two strands had a slightly different design and was made for Mrs. Greville in 1929 using her own stones. Cartier later altered their initial creation to its current design and added the shorter necklace of three strands to sit inside, again using stones already in the Greville collection. All five strands worn together make a staggeringly opulent impression. Whether acknowledging that over the top effect or simply bowing to personal preference and the practical difficulties of using such a large piece, Queen Elizabeth did not often wear all five strands, usually saving it for special occasions. She did wear the three strand version alone, especially in her later years. She used the necklace until she passed away in 2002, at which time it passed to The Queen. Along with a large portion of her late mother's collection, The Queen has loaned the Greville Festoon Necklace to The Duchess of Cornwall. She debuted it with all five strands blazing at The Queen's banquet for the Commonwealth Heads of Government Meeting in 2007. She has worn it only three times in public, on all occasions wearing all five strands. On two of those occasions, she paired it with the Greville Tiara. The Greville Tiara (from the same bequest, clearly) is a perfect match for this necklace, and I am hoping that we will see The Duchess begin to use the three strand version of the Festoon Necklace with it in the future.